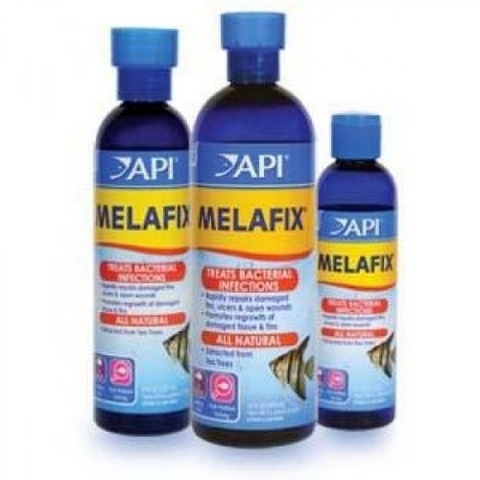 Melafix is an all-natural antibacterial treatment that works to treat infections in fish. Common bacterial infections are open wounds and abrasions, tail rot, eye cloud, and mouth fungus. 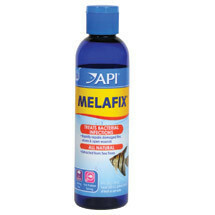 API Melafix also promotes regrowth of damaged fins and tissue. Product may be used when adding fish to an aquarium – particularly to smooth the transition from store to home – and if an infection is suspected, but not yet diagnosed. Some fish bought in pet stores are already carrying diseases at the time of purchase, which may be difficult to detect in its early stages. API Melafix will not adversely affect the biological filter, alter the pH, or discolor water. It is safe for use in freshwater, saltwater, and reef aquariums, and in aquariums with live plants. Dose for the recommended amount of time as directed on label, and in accordance with the size of your aquarium. 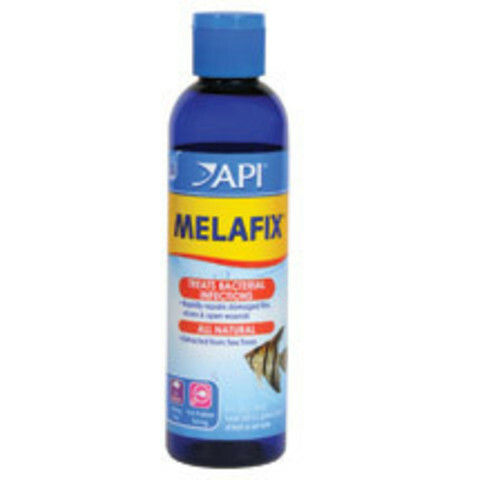 MELAFIX is a treatment for external bacterial infections in fish, such as fin rot or open wounds. Is MELAFIX safe with invertebrates such as snails and shrimps? Will it harm the biological filter? Will it harm plants? Yes, MELAFIX is completely safe with invertebrates such as snails and shrimps. It will not harm the biological filter – the bacteria in the biological filter are quite different from those that are found on the fish. It will not harm plants. Will MELAFIX work in both freshwater and marine (saltwater)? Yes, MELAFIX will work in both freshwater and marine (saltwater). However, we recommend turning off protein skimmers and UV sterilisers when using it. If you have carbon in your filter, this should be removed before using MELAFIX. I saw foaming in my aquarium when using MELAFIX. Is this normal? Is It harmful? It is normal to see some foaming when using MELAFIX in the aquarium. This is not harmful. Can I use MELAFIX and PIMAFIX together? Can I use MELAFIX with any other API medications or products? MELAFIX can be used with all other API medications and products.